What Does Code P0172 Mean? Your engine needs to put in the right amount of fuel for the amount of air coming into it, that is, the proper air-fuel ratio, to deliver the best power and fuel economy. The ECU (engine control unit) uses a number of sensors, such as the MAF, CKP, and ECT (mass air flow, crankshaft position, and engine coolant temperature) to determine how much fuel to put in. Using feedback from the HO2S, AFR (heated oxygen sensor or air-fuel-ratio sensor), or Lambda sensor, the ECU can fine-tune fuel injector pulse-width (IPW) to deliver the best air-fuel ratio. As suggested by the names, the HO2S is sensitive to oxygen (O2) content in the exhaust, which has a direct relationship to air-fuel ratio. On combustion, some of the oxygen in the air is used to oxidize the fuel, leaving a small amount in the exhaust, which the HO2S measures, sending a signal back to the ECU. If there is a lot of oxygen, this means that the engine is running lean, that is, not enough fuel was injected. Conversely, if there is very little oxygen, this means that the engine is running rich, that too much fuel was injected. Under normal operation, the ECU cycles between rich and lean air-fuel ratios, at the same time learning short-term fuel trim and long-term fuel trim (STFT and LTFT) values. Typically, fuel trims will be within 3% of the ideal, dependent on current air and coolant temperatures and load, for example. On the other hand, engine problems, such as high fuel pressure, a skewed MAF signal, or a faulty fuel injector, may dump in more fuel than required, or misreport how much air is entering, resulting in a rich condition. The ECU will try to compensate, by reducing IPW, but if fuel trim goes over -25% or so, the ECU interprets this as a malfunction, setting a DTC (diagnostic trouble code), DTC P0172 – Fuel System Too Rich (Bank 1), and illuminating the MIL or CEL (malfunction indicator lamp or check-engine light). What are the common causes of code P0172 ? Depending on year, make, and model, DTC P0172 may have number of causes. Here are some of the most common. Toyota / Lexus – Contaminated MAF, usually with aftermarket filters. The reasons for this correlation aren’t clear, but many Toyota hotwire MAFs are particularly susceptible to contamination. Cleaning isn’t usually successful. Discard the old MAF and engine air filter. Clean the air box and install the new MAF and air filter, preferably using OEM parts, making sure that the air box seals properly. Oiled Filters – Some engines with a lot of blow-by, whether by design or age, and may allow oil into the air box, and subsequently, the air filter and MAF. Also, some aftermarket air filters require oil treatment for proper operation, which some owners may be overzealous in applying. In either case, excessive oil can contaminate the MAF, leading to skewed air flow measurements. Also, check that the PCV and tubing are in proper working order. Dirt – In an ideal world, your engine bay would be spotless. Over time, however, dirt and grime builds up, and it can easily find its way into the engine and control systems. Older and neglected vehicles can easily suffer MAF contamination, for excessive dust and dirt or a poorly-sealed air box. Leaking Fuel Injector – Age or contamination may cause a fuel injector to leak, dumping fuel into the cylinder even when not commanded. Check the oil for fuel smell, which is a good indicator of fuel leakage. Leaking Fuel Pressure Regulator – Some vehicles, with vacuum-operated fuel pressure regulators, have been known to leak internally, passing unmetered fuel directly into the intake. What are the symptoms of code P0172 ? Depending on the nature of the failure, DTC P0172 may or may not be accompanied by drivability issues. At the very least, you will experience poor fuel economy, because, with the ECU in “limp-home mode,” it is no longer looking at HO2S and AFR sensors for feedback. On the opposite end of the scale, you may note rough idling, lack of power on acceleration, even misfiring or stalling, which tends to get progressively worse as the engine warms up. Particularly bad cases may be accompanied by black exhaust smoke and a blinking MIL, alerting you to possible catalytic converter damage. You may also smell a strong fuel odor and see black soot in the exhaust tip or the back of the car, an indicator that a lot of unburnt fuel is making it through the system. How do you troubleshoot code P0172 ? Pro Tip: Before diagnosing fuel trim problems, it does one well to note that the Fuel Trim Monitor will not run unless the HO2S monitors have run and passed first. The fuel trim monitor uses the oxygen sensor to run, which means that fuel trim codes are not oxygen sensor codes. P0172 with P0175 or MAF DTCs – If you note both P0172 and P0175 or concurrent MAF-related DTCs, then you can likely rule out individual cylinder, ignition, and fuel injector problems. Instead, focus on the fuel injection system and the MAF. MAF contamination could skew air intake measurements, therefore skewing fuel injection calculations. Cleaning may solve the problem. replacement, along with a new air filter and properly sealed air box, would be a more permanent solution. Check fuel pressure, making sure that it is within the proper range. Excess pressure, such as caused by a defective pressure regulator or pinched return line, would result in more fuel being injected than the ECU is expecting. Verify proper ECT and IAT (intake air temperature) readings. The ECU may or may not pick up on stuck sensors, so it does one good to check that ECT and IAT are in normal ranges. For example, if you’ve been running the engine for half-an-hour on a hot day, the ECT should read at least 175 °F. If it still reads 32 °F, the ECU will enrich AFR to compensate, resulting in a rich condition. P0172 with other Bank 1 DTCs – If you note only P0172, maybe concurrent Bank 1 DTCs, such as a cylinder misfire, focus your attention on Bank 1. 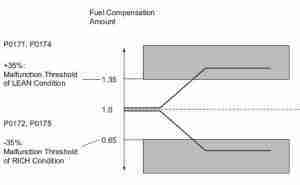 Fuel Pressure Drop – With the engine running, record fuel pressure, then shut the engine off. 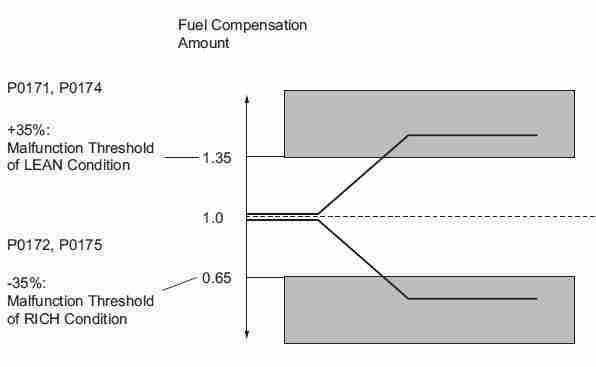 Fuel pressure may drop slightly, but should remain stable for at least 10 or 15 minutes. If the fuel pressure continues to drop, you could have a leaking fuel injector, which would lead to a rich condition and possible misfire condition. Cylinder Misfire – A misfiring cylinder would dump unburnt fuel into the exhaust stream. Diagnose and repair a cylinder misfire before attempting to diagnose a rich condition. Pay attention to concurrent DTCs, such as those pertaining to VVT (variable valve timing) or the ignition system. Exhaust – Check the exhaust for leaks between the cylinder head and oxygen sensor. While the exhaust system seems like a positive-pressure system, air can enter in the partial vacuum created by the exhaust pressure pulses. Atmospheric oxygen entering before the HO2S would skew oxygen content measurements. Check voltage on the Lambda sensor. While the engine is running, it should fluctuate somewhere on the order of +/- 0.3 V every second or so. If it sticks, you have a faulty sensor. Make sure you have proper fuel pressure, about 36 psi at idle, up to 45 psi with the fuel pressure regulator vacuum line disconnected. If pressures are off, you may have a defective regulator or a poor vacuum source. Turn the engine off and make sure fuel pressure stays stable. If it drops, you may have a leaking fuel injector. I have a 2009 Hyundai accent 1.6l l4. I think we need more background information regarding your vehicle history: list of DTCs, current mileage, previous repairs, etc. I’m guessing that you’re posting in the P0172 discussion because you have this code. Are there any others? If the engine is running rough, that would indicate a misfire, the excess unburnt fuel and oxygen throwing off the fuel trim readings. I think I would start with checking the spark plugs, perhaps doing a compression test, and a fuel pressure test. My research indicates that coil packs are a major problem on this engine, which it seems that you replaced, but why did you replace the ignition coils, and then again a month later? Did the first coil-pack replacement fix the problem, even if only temporarily? Is the coil pack wire harness in good condition? Are you using factory coil packs? Are you using stock spark plugs gapped to 0.035″? my accord 2004 2.4 is taking to much gas, around +25%. Went to check, code P0172. I replaced the sparks, MAF filter, O2 sensor. I noticed that RMP improved, it accelerate faster especially while driving in the city. After driving 12 km the check engine light it pop up again with same 0172 code. My mechanic suggest me to replace the injectors and adjust the valves. What do you think? What did you mean by “MAF filter?” You mean the air filter? O2 sensors will not cause this problem, as the ECM needs good O2 sensor readings to measure fuel trim. In any case, did you replace them with genuine Honda parts? Without seeing the car itself, my first reaction would be to check the fuel system for injector leaks. Measure fuel pressure and then shut the engine off. Fuel pressure should drop only very slightly. If it steadily drops, this means you have a leaking fuel injector or fuel pressure regulator. Pinch off the fuel return line to eliminate the regulator as the cause of the drop. If fuel pressure still drops, this means you have a leaking fuel injector, which could definitely cause a rich code. Otherwise, I would suspect a contaminated MAF sensor, which you can attempt cleaning or replacing. Benjamin, It’s me again I’ve finally removed the oil pump and cleaned the screen and all surfaces to reseal oil pan after I replace oil pump but I have another snag …. the rod won’t easily come out of old pump to go into new one, help?! Do you have a picture? Try posting it in your next comment? OK, I’m going to admit that I don’t know much more about this, because I’ve never actually removed the oil pump on this vehicle. From what I can tell, when I look up oil pump for your car, there’s a drive shaft coming from the oil pump, which is part of the assembly. Then, there’s an intermediate shaft which appears to be stuck onto the old pump that you have in the picture. Seeing as you’re replacing the oil pump, you can make relief cuts on the oil pump shaft, using a die grinder, to make removal of the intermediate shaft easier. Seems odd that the intermediate shaft is stuck in the first place, however. Unless you have O2 sensor codes, do NOT replace them. They are not the cause, as the ECM needs their good readings to monitor fuel trims, that is, O2 sensor codes prevent fuel trim codes. In any case, it seems like the low oil pressure thing is VERY common on your engine, but doesn’t seems to be related to fuel trim. Some have suggested using a higher weight oil to address that problem, especially in high-mileage vehicles. If you use 5W-20, maybe 10W-30 may help. Regarding your fuel trim problem, P0172 means the engine is using too much fuel, and the ECM is trying to reduce it. If there are fuel problems, such a leaking fuel injector or stuck fuel pressure regulator, unmetered fuel will simply dump into the cylinders. A good idea would be to check the spark plugs again for fouling. Otherwise, it may be a good idea to try a known-good MAF sensor, as cleaning doesn’t ALWAYS solve the problem. The regulator is an easy fix, mounted on the end of the fuel rail by the intake. I’ve seen these regulators from $17 to $70, though I don’t think I would recommend the $17 one unless you are in a serious bind. Higher prices typically mean better quality and a warranty, so I would shoot for the $50 mark on this one. It’s a cheap fix, but I would still start with a fuel pressure tester, if you can rent or borrow one. Fuel pressure should be 40 – 45 psi, whether the engine is off or idling. Make sure the vacuum line going to the regulator isn’t blocked, as this would boost pressure. Another thing you should consider is checking the oil. If it smells like fuel, change it. You may need to clean the MAF again. Sorry, it took a while to reply Benjamin. I’ve been on vacation then came home to ac problems. Thanks for the good info I will check into the fuel pressure tester and the smell of oil, but it is looking like I will eventually need to replace the oil pump. If the oil pump doesn’t help with the oil pressure problems, it probably means you need an overhaul. I would definitely check with a professional on this one. My car is back on the road thank you very much Benjamin! I’m glad that you were able to get everything worked out! I have an 03 acura rsx base automatic. P0172 keeps coming up replaced map sensor, fuel pressure regulator and plugs. My mpgs are same no black smoke or smell of fuel. I do have the rough idle but i have no issue while driving car. Any ideas? Vaccum line is good only tsb that comes up is about cold air intake to make sure clean because its know to throw code of oilly intakes. I will check valve clearence today. I was told possibly canister purge solenoid or the iac but not sure. You could try blocking the canister purge line to rule that out. (You might get an EVAP code, but you can ignore it. Actually, I’d think a purge problem would most likely show up as a lean code.) Thinking about blow-by, did you notice any oil fouling of the spark plugs? Also, check the fuel pressure to see if it is dropping after you shut the vehicle off. If it keeps dropping after a few psi, then you could have a leaking fuel injector. An IAC problem might cause rough or inconsistent idle problems, but probably not a fuel trim problem, since it’s inline with the MAF, so any of that air would be metered. I changed fuel filtter and spark plugs ,i think i went wrong way. It’s OK if you’re confused. It happens to the best of us! When you say went wrong way, I hope you don’t mean you broke anything. If the engine’s running, then we’re off to a good start. When you changed the spark plugs, did you happen to notice if any of them were particularly dirtier than the others? When the engine is running, does it seem to run OK, or is it misfiring? A fuel pressure leakdown test might point to a leaking fuel injector, particularly if you notice that the oil smells like fuel or if the engine is misfiring. I would start with cleaning the MAF and replacing the air filter. If the oil smells like fuel, change that, as well. You may need to replace the MAF if it doesn’t respond to cleaning, but have that checked by a professional before you drop a couple hundred dollars on a new one. Ahhh, filling the gas tank might be the key to solving this problem. Am I right in thinking that it runs normally otherwise? For example, when the vehicle has half a tank, and you start it first thing in the morning, how does it run? If the engine is running fine at that point, clear the codes and see if it comes back. If the code only appears after you’ve refuelled and you’re having a hard time starting, this might be a different problem. MAP with key on engine off should be 50 kPa. MAP with engine idling should be 75-85 kPa, but only when the engine is running fine. You may have an obstruction or leak in the vacuum line going to the MAP sensor, leading to inaccurate MAP sensor readings. Old vacuum lines can crack, or there could be carbon buildup in the port feeding it. You could also compare MAP readings to readings from a vacuum gauge, which should read around 21 inches Hg at idle. Let us know what you come up with. You could also check STFT with the engine running and the EVAP purge line pinched off or disconnected and plugged. If the STFT calms down to less than 5%, this would indicate a leak in the EVAP system, and you’re getting fuel vapors enriching the system when the ECM isn’t expecting it. Hello there,could do with your help! With one particular code reader, I also get the P0089 code too. P0089 refers to the fuel pressure regulator, which can cause fuel trim problems. On the other hand, your fuel trim numbers seem perfectly fine. Usually, unless FT goes over +/- 10% or 25%, it won’t trip a fuel trim code. Your MAP sensor reading concerns me, though. Is that a live reading or a freeze frame reading? It seems like it should be higher, idle MAP reading around 75 kPa. Check for vacuum leaks or blockages to the MAP sensor. If you can access live readings, you could try applying vacuum directly to the sensor and see how the ECM sees it. Idle vacuum should be 21-23 in. Hg or around 75 kPa (see if the ECM sees this reading when you apply it manually). Mechanical problems can cause lower-than-normal MAP readings, skewing fuel trims rich. my 02 VW beetle 1.8T is giving me the P0172 code. LTFT is -20%, but will go back to normal (around 0%) shortly after I unplug the MAF. Tried to put on a new after market MAF, but LTFT will go up to -20% even faster. Could this caused by a bad O2 sensor? what else do I need to check ? thank you. Unplugging the MAF immediately puts the system into limp-home mode, so FT returning to normal doesn’t mean much in this case. The Lambda sensor must pass the monitors first, or else fuel trim monitors will not run, so you can rule that out. Do you have any other DTCs in the system, aside from when you unplugged the MAF? Can I ask what kind of spark plugs you have? Searching around, I’m finding that VW simply react well to certain spark plugs. I would try a set of stock spark plugs, research telling me that NGKs gapped to 0.028″ seem to work well in this engine. Some spark plugs simply don’t achieve a complete burn, which doesn’t use up all the O2 in the air, resulting in a rich determination. I’m sorry to hear about all the problems you’re experiencing! There are a number of things going on here that seem like they might all be interacting. This might be difficult, but I think if you attack it one problem at a time, With a cylinder misfire, I think you need to diagnose and repair the misfire first. Coil 6 you already replaced, as well as the spark plugs, which didn’t seem to fix the problem. When you removed plug 6, was it soaked in fuel? Is the coil firing at all? Try plugging in the coil put leave it out of the hole where you can see if it sparks. Try swapping it with coil 4 to see if anything changes. If that doesn’t help, you might have a leaking injector (see if fuel pressure drops when the vehicle is shut down) or a compression problem (do a compression test – 110 psi is typical). The MAF and IAT codes concern me as well. Problems here would lead to fuel trim problems, for sure, but they wouldn’t lead to a single-cylinder misfire. Can you start the engine with the MAF and IAT disconnected? That might help to isolate the misfire so you can focus on that. I know these can be complicated issues, especially when they all come at once. I hope this helps you get in the right direction. Hoe is it going everyone. I have a 2003 beetle turbo s. P0172 code. I did the typical tune up. Changed the spark plugs, filters, cleaned the MAF, new fuel tank cap. Ran the beetle for 100 again and again I don’t remember how many times. Kept on getting the p0172 code. I went ahead and replaced the 02 sensors thinking this would fix it. It didn’t. After reading more infor and noticing that “not enough air” means “too rich”, as far as fuel is concerned, I looked at a couple of vidoes on youtube and watch one in which the mechanic was talking about the long and short trim fuel trim. It did make some sense, but when he said to physically check for any air leaks while the engine is running and found a cracked air hose; and replaced it, everything got fixed. No more engine light. This brings me back to my problem. I had the engine running and checked every single vacuum hose and any other hose on sight. I thought I was done. I didn’the find any air leaks what so ever. Until I reached behind the engine right in between the engine and the firewall. There is an emissions hose. I don’t know the exact name of it, but to the naked eye it looks fine. When I lifted it I was able to hear a sound of an air leak. I lifted more just to see that the crack on this hose was about two inches long. Any how. I went to the local auto parts store, replaced the hose, tightened it with the proper clamps, ran it for about 10 miles; and was smog ready. No engine light came on. It’s fixed. Hopefully this helps anyone out there. Thx for the reading. I wish more people would chime in with their own repair experiences, especially with fuel trim codes. These are the most misdiagnosed codes (EVAP codes are also a total pain) in the business, and there are too many who just jump right on the oxygen sensors. I hope that someone else reads this and it helps them, too. Hello do u know wheres the MAF LOCATED ON A 2014 challenger? I’ve been looking around for a few minutes and I can’t find a picture of where it’s located on your vehicle. Generally, the MAF needs to be in the air flow, so that means it has to be in the intake tube somewhere between the air filter and the throttle body. Look for a connector with 3 or 5 wires. A 3-wire sensor is a MAF and a 5-wire sensor is a MAF/IAT combination sensor. If you find a 2-wire sensor, that’s usually just the IAT. Hi. I have an Audi a4 2004, 1,8t 163hp. first i had an P0171 code, and the local Audi dealer (the best mechanics) said I need to change my MAF. I bought a part online and installed it myself. Then, a few days later i get an P0172 code. do I need to reset the ECU after i installed the new part? i tried to do so by taking the battery out, but it didn’t work. i have also changed the spark plugs and the top cover sealing on the engine without luck. I have to wonder if the MAF you got is genuine or not? Also, if you put in the original MAF, does the P0171 come back? Hello Benjamin. thank you for the valuable information that you are offering. I have a Toyota Allion 2006 make which has been having loss of power uphill or in high speed acceleration, rough idling and check engine light once the power loss comes. I had it checked and a P0172 code noted.the spark plugs were replaced and the throtal body and sensor cleaned. the fuel pump and fuel filters were also changed and the air filter changed. when i drive less than 70 kpm and short distances there is no issue. however when i drive long distance (more than 35km) or drive at 100 kpm the problem tends to be coming more. if the problem starts and i put off the car for more that 15 minutes things get better but if I persist driving it gets worse. the problem has not gone. what else can i have checked, please advice me. First, make sure all the hoses and tubes are secure. I think the first thing I would suspect would be the MAF sensor. Cleaning isn’t always effective. Make sure you use a Toyota air filter (others don’t seem to filter well enough or fit well-enough to keep the MAF from getting gunked up) and a Toyota MAF. The rough idle after you’ve been driving long distance makes me think you might have an EGR problem. At highway speeds, the EGR would be open to reduce cylinder temperatures. If the EGR is sticking, it won’t close when you return to idle, leading to rough idle. At that point, you might not be able to start the car. With the car idling rough, tap the EGR valve with a hammer and it should close and make the engine run smooth again. The problem is still on after cleaning the MAF sensor at Toyota Kenya service dealer. I have had it checked again by a diagnostic machine and the technician told me that we have a a vacuum leak. He said the fuel pressure is fine and all the hoses are well fitting. He advised that we change the air inlet manifold. Will this help? can this help without bringing more complications? I recently also experienced hardening of the break paddle when the vehicle was loosing power and showing the engine light. Could this be related? That’s an interesting development. Hard brake pedal might be related to a loss in vacuum. I wonder if you might have a vacuum leak through the brake booster? I can’t remember which vehicle it was, but there was a series of recalls for vacuum leaks at the brake booster on some Toyota and Lexus vehicles here in the US. The reason for the recall was for loss of braking, but vacuum leaks would also cause the check engine light to come on. In any case, I think you might have multiple problems. Also, vacuum leaks would lead to a lean problem, not a rich problem. I really think you might need a new MAF sensor for the P0172. I’ve replaced dozens for exactly that reason, and always on vehicles with non-Toyota filters. I’m not sure what causes the problem. Maybe the aftermarket filter doesn’t seal properly or allows too many contaminants through? Nearly every time, however, barring other problems, such as high fuel pressure or a leaking injector, it’s a contaminated MAF sensor. i went back to Toyota Kenya for a specialized diagnosis and the found faulty ignition coils. I saw in the report that the injectors are fine as well as the vacuums. I will buy the ignition coils for replacement shortly and hope to see the problem gone. I will inform you how it goes. I suppose faulty ignition coils could cause misfiring, but if it wasn’t consistent enough to set a P030x code, then I’m not sure if it would have anything to do with P0172. I guess we’ll have to wait and see. Regarding a previous message, replacing the “air inlet manifold,” was the technician able to find an intake leak or was that just a guess? If it’s a genuine intake manifold leak, and not at one of the intake gaskets, I can’t say it’s impossible, but it’s definitely not common. For now, ignore everything but the engine coolant temperature sensor and the turbocharger wastegate and bypass valve. Check that everything is connected. You’ll probably need to benchtest the turbocharger parts to see if they’re working, because the ECM thinks they don’t and isn’t controlling them. Disconnect the ECM and check the circuits to the engine coolant temperature sensor and the turbocharger wastegate and bypass solenoid/valve. My guess is that things were left disconnected. Broken wiring could be a cause, and a circuit check from the ECM should help you determine this. Need to find a wiring diagram for this car to diagnose further. That seems like a lot of oil! I wonder if whoever put the K&N in there didn’t know how to oil it properly? You could have another problem, too, though. I think I would start with replacing the PCV valve, as that might be letting oil past it into the intake. I was reading up a little bit and it seems like the engine on this one is known for excessive blow-by, some people suggesting installing an oil catch-can and by-passing the PCV system into that to capture it. I loved your description and detailed information about this code. I have mazda cx7 2010. I recently (4 months) changed turbo (with its oil pipe) at the dealer original oem. I started to hear wistling noise from engine bay but without codes. Drivability was acceptable. They incested that it is MAF. So i accepted because I have no other choice. Yep, they installed new MAF and air filter and deleted the codes. I pay 300 usd and after a week… pop, the codes came again with same symptoms as before: poor acceleration, fuel smell, sometimes rough idle, hesitations while accelerating, and little black smoke only on first startup in morning. Along with p0172 and p0101. Note: they did not replace my cat converter. I read that cat converter should be checked and most likely replaced with turbo replacement. HELP !!! I NEED HELP. I dont have any car mechanic neer me who knows anything about turbo charged cars. And the dealer is doing no good either. Spark plugs replaced at 130000 km also new air filter and new MAF sensor are installed last month. Is it vaccum leak? Is it exhaust leak? How to make sure using readings or any reliable method. I want to diagnose the issue myself then ill tell the dealer what to do, i have no other choice. I need your reply soon. Thanks in advance. I totally understand your frustration. In doing some research on your car, it seems like an exhaust or turbocharger leak might cause both the whistling noise and the lean code. 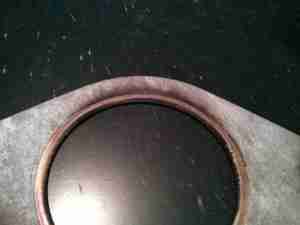 If you can seal the leak, maybe new gaskets or making sure everything is properly aligned, that might take care of it. If not, running rich all this time, as Mazda are wont to do, you might need a new forward oxygen sensor. Someone said they were able to burn the soot off the oxygen sensor with a propane torch to solve the problem, but I’m not sure how effective that might be. Long term leaks, on the other hand, would fool the ECM into dumping in more fuel, leading to soot formation. The cause is likely to be the leak, the soot just a symptom. Actually, I forgot to mention, I have STFT reaching -10 to -15 and the LTFT most of the time at -20. The Mazda dealer is only clearing the codes. So, when clearing the codes the car will run fine for a short period of time (like 15 days) then the same codes pop again. P0101, P0172. I think that the reason behind this is ECM learning the LTFT so when clearing codes the computer will reset LTFT and it needs some time to get -20 reading again and throw the P0172. So, I will try to check exhaust / turbo leaks first. Question: how to make sure that I don’t have faulty injector? How to check O2 sensor using monitoring obd data? Im reading values between 0.1 and 0.8 volts for O2 sensor. Last but not the least, can a faulty turbocharger induce this code, or shall I consider my turbocharger a good one? The warranty on my turbo is going to expire after 20 days only. I don’t want to pay another 2000 usd on that turbo again. Thanks a lot for your time and effort to help me. If you need any data or specific readings, please feel free to ask me about it. Actually I have rich code not lean. Anyway, I did one test using obd readings on the “fuel rail pressure” when car engine is on at idle it reads about 450 to 500 psi !!. When I turn off engine it drops slowly to reach only 50 psi. And While im driving it is reaching 1600 psi. But, it reads psi !! I know that 500 psi is not logical pressure coz it shall be in 40 or 50 range which is about 3.5 bars. So, I think that the units are not consistent but the idea is: it is dropping !! 1. 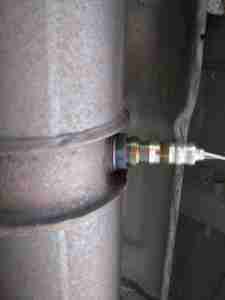 Shall I consider my problem as a leaking fuel injector? 2. 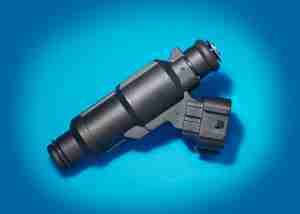 How to know which injector is the bad one? 3. Can I do it myself or shall I head to a good mechanic or specialist? 4. If the O2 sensor is sensing rich condition and I am smelling fuel around my car, does this mean that my o2 sensor is working properly ? 5. What do u mean by possible EGR system problem ? Do u mean a possible stuck-open EGR valve? 6. Shall I check the purge valve for any fault knowing that I have only p0172 and p0101 codes? 7. If I removed the O2 sensor outside the exhaust, and drive my car and still have low power, what does that induce? Ambient / intake / engine coolant temperatures are all within specs and logical. When idle after a long drive, IAT sometimes reach more than 95 degree Celsius while ambient is around 30 degrees. One important note: I used to have a problem in my Oil Control Valve, it was sooty (coz my engine oil was very black and maybe burned) and I cleaned it and the problem solved 90%, I suspect maybe the EGR is having same problem. Last question: if I want to replace my PCV, which is located under air intake manifold and charge air cooler, do u recommend to change the EGR and cleaning injectors and throttle body at the same time ? Does that has anything to do with p0172 , p0101 combination code? Im sorry for long reply but I thought maybe u need this information to have a better view of this problem. 06 Chevy aveo P0172 is the only code. When it starts up it idles high but after about 30 seconds sounds normal and runs normal. If I try to put it in great while it’s idling high it kind of spits and shooters and wants to stall. Any suggestions? 2003 Ford Ranger 4.0L getting codes p0172 first, then p0174. Occasionally P0300, p0316, p0301, p0302, p0303. We have replaced MAF, injectors, coil pack, spark plugs and wires, fuel pump, PCV valve, timing chain tensioners X2. O2 sensors appear new. Can you advise? I have a 2005 Nissan Altima 3.5 V-6. Code PO300, PO 1283 then PO172. Rough idle and very poor accelaration unless i floor it. Replaced both 02 sensors. Still shows Bank 1 problem. Replaced spark plugs. Pulled 1 out and shows very clean, white porcelin. Would the 02 sensor cause these problems? Took it to a Nissan dealer and they couldnt figure it out. Replaced EGR valve and EGR temp sensor. Put new intake gasket on it. Have replaced valve cover gaskets. Motor mounts and trans mounts. they were all bad. Any ideas. i have a 2011 Merecdes E350 W212 4 Matic. with confirmed codes P0172 and P0175 (bank1&banck2) system too rich and in the pending list P0300, P0306, P0305 cylinder misfire also permanent list P0172 system too rich (bank1), i tried to clean the MAF sensor with the sensor cleaner but no good. any ideals to help ? New to all this but I picked it u as a hobby…2006 Chrysler 300 2.7 (base)….starts up fine but when it reaches normal temp the idle runs rough…P0172 and P0175 rich condition both banks….the LTFT are about -35% on both banks. When RPM go up 2500+ the LTFT1 goes down to 0 bit the LTFT2 stays at about -30%. Have checked all sensors are either good or replaced bad ones…injectors are new…no gas smells or excessive exhaust smoke….what am I missing??? History…the vehicle was overheated to the point that it stop (did not cease the eng but it died)…there was a lot of sludge in the engine…broke it down to the block and replaced: all gaskets, timing chain, oil pump, water pump, injectors, valve seals, lapped valves…I also replaced one of the pistons/rings because it was cracked. I did inspect for any warped block/heads and they seemed ok. Can it be the PCM…how would I check? For system too lean, check for intake leaks, perhaps a vacuum hose removed? Other possibilities might be leaking fuel pressure regulator (if vacuum-modulated), vacuum brake booster, loose intake hose (after the mass air flow meter), or faulty intake manifold gaskets. Google Translated: I have a car Nissan VERSA 2008 shows the code p0172 has been switched to the first sensor and the second and the air filter and the entire gasoline system shows the code p0172 What is the work? The first thing I would check is the mass air flow sensor for contamination. This seems to be a common issue with Versa (as it is for many other MAF vehicles). A quick note for everyone working on fuel trim codes: replacing air-fuel ratio sensors or oxygen sensors will not fix this problem. The ECM has already confirmed AFR/O2 sensor operation. Otherwise it would be unable to check fuel trim. جوجل المترجمة: أول شيء أود أن تحقق هو جهاز استشعار تدفق الهواء الشامل للتلوث. يبدو أن هذه مشكلة مشتركة مع Versa (كما هو الحال بالنسبة للعديد من المركبات MAF الأخرى). ملاحظة سريعة لكل شخص يعمل على شفرات تقليم الوقود: استبدال أجهزة استشعار نسبة الهواء للوقود أو مستشعرات الأكسجين لن يؤدي إلى حل هذه المشكلة. لقد أكدت ECM بالفعل وجود مستشعر AFR / O2. وإلا لن يتمكن من فحص الوقود. I own a 2002 Honda CRV (130K Miles). PO172 Bank 1 System Running Too Rich. My vehicle does not come equipped with a EGR Valve System nor a MAF Sensor. I installed New Spark Plugs Bought it From the Dealer. I installed new Air Filter Bought it From the Dealer. I Cleaned the Throttle body and all Sensor located on the throttle body ( IAC, Map Vacuum Lines look Good). I filled up Fuel tank and used Fuel injector Cleaner. I did a full Valve Adjustment, No More Ticking. Bought it From the Dealer. The Check Engine Light Still Appears, I have erased it more than 10 times already. I have a Peugeot with the ep6dt engine and a p0172 fault code. Tried a few things to no avail. Lambda sensors, and both map sensors changed. Still rough idle etc. Any ideas? So I’m getting p0172 on my 09 Camry 2.4L. it only shows up on cooler days(55 degrees and lower). I looked at the snapshot and noticed the air intake temp was -40. I was originally going to try replacing the ECT but now I’m thinking I should replace the intake sensor. Am I correct? I wonder what the IAT reads on warmer days, just for giggles. In any case, -40 °F is a default sensor disconnected or sensor shorted. I’d definitely be heading in the direction of the IAT sensor or its circuit. Since the ECM thinks IAT is so cold, it dumps more fuel into the mix, resulting in the too-rich DTC. I have a Peugeot 308 with ep6dt engine and a P0172 fault code. Rough idle, stalling etc. What do you suggest. Hi all, i have mercury grand marquis 2002 Ls. The problem is that i have replaced all 4 of my O2 (oxygen) sensors but still i am getting codes P0172, P1152. My car easily goes to 100 mph no issues in power but sometimes the car jerks when i lift my foot of the gas paddle. I have new spark plugs, coils are good but still it also sometimes show cylinder 6 misfire. Please help me! I have a 2012 Mini Cooper S R56 that currently has the check engine light on with code P0172 (showing as permanent). So far I have had the high pressure fuel pump replaced, the air intake box, the thermostat/thermostat housing, valve cover gasket (due to leakage during a smoke test), all 4 spark plugs, and both O2 sensors. I have cleaned the MAF with CRC MAF cleaner as well. Even with all of this I have had the light continuously come back on even after clearing all codes. The other codes that tend to pop up along with the P0172 are P0300 (random misfires detected, and those have been on cylinders 1,3 and 4). I had a mechanic look at the cylinders and he said they look good. Also I am not noticing any drastic fuel consumption issues as I can fill up and not have to do so again for 2 weeks (average 26.8 miles a gallon). I have noticed over time black soot on my exhaust as this problem has been going on for the last 6 months. The only things I have left to try are checking all the hoses for a vacuum leak, and possibly replacing the MAF and or cylinders. I am just looking for some advice regarding this issue.